Chemistry: FeAsO4 - 2H2O, Hydrated Iron Arsenate. Scorodite is an attractive and colorful mineral. 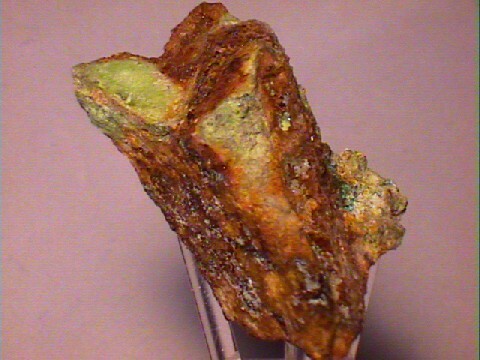 It forms in the upper oxidation zones of arsenic rich ore bodies. The ore bodies in which scorodite is usually found contain the mineral arsenopyrite, FeAsS. Scorodite has also been found as a crust precipitated on the outer rims of hot springs. Crystals of scorodite can form dipyramids that look like octahedrons. These pseudo-octahedral crystals will also resemble the much harder gem mineral zircon. The color of scorodite is variable but it is most known and revered for its bright green or blue colors that really establish scorodite as a wonderful display mineral. Color is colorless, white, green, blue, yellow and brown. Luster is vitreous to sub-adamantine or greasy. Crystal Habits include pseudo-octahedral crystals that are actually orthorhombic dipyramids. Also tabular crystals and fibrous and crusty coatings. Cleavage is very poor in a few directions. Hardness is 3.5 - 4. Specific Gravity is approximately 3.1 - 3.3 (average for translucent minerals). Other Characteristics: Soluble in hydrochloric acid. Associated Minerals are arsenopyrite, limonite, adamite, olivenite, arseniosiderite and other oxidation zone minerals. Notable Occurrences include the famous mines at Mapimi, Mexico; also Lavrion, Greece; Ouro Preto, Minas Gerias, Brazil; Cornwall, England; Tsumeb, Namibia; Ontario; California, USA and Zacatecas, Mexico. Best Field Indicators are color, luster, non-fluorescent, associations and crystal habits.